Effortlessly elegant yet incredibly robust, the recently delivered 55 metre Lili is managed for charter with Imperial Yachts. Find out what makes this stunning vessel the ultimate superyacht to tick off your vacation wish list... 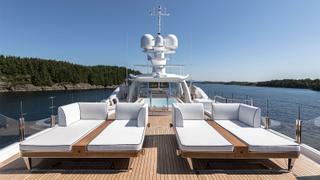 Packed with customised features both above and below deck, Lili focusses on leisure and luxury for all. An extended sundeck boasts 175 square metres of deck to play with, meaning a four metre counter-current swimming pool fits perfectly forward, with space to spare aft for the al fresco cinema for movie or karaoke nights under the stars. There is also a bar, outdoor dining table, sunpads and lounge, making the sundeck the ultimate social hub of the superyacht. The private owner's aft deck features an expansive lounge with soft seats and loungers where the owners can enjoy some peace and quiet while looking out over your chosen destination. An alternative dining area can be found on the main deck aft, while a generous swimming platform offers the perfect spot for boarding water toys, sunbathing next to the lapping waves or launching off on a diving adventure. 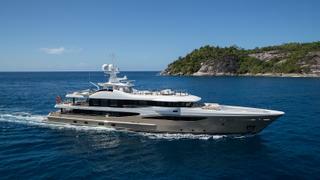 Packed with customised features both above and below deck, Lili focusses on leisure and luxury for all. An extended sundeck boasts 175 square metres of deck to play with, meaning a four metre counter-current swimming pool fits perfectly forward, with space to spare aft for the al fresco cinema for movie or karaoke nights under the stars. There is also a bar, outdoor dining table, sunpads and lounge, making the sundeck the ultimate social hub of the superyacht. The private owner's aft deck features an expansive lounge with soft seats and loungers where the owners can enjoy some peace and quiet while looking out over your chosen destination. An alternative dining area can be found on the main deck aft, while a generous swimming platform offers the perfect spot for boarding water toys, sunbathing next to the lapping waves or launching off on a diving adventure. Lili boasts a brilliant crew of 13, including a masseuse, a professional diving instructor and much sought after chef. The on board instructor has been a keen diver for more than seven years, working professionally in the field for more than five. As a MSDT – a Master Scuba Diver Trainer – he is able to tutor guests through a huge variety of diving courses for a broad range of abilities while on board, whether that be for a one-off dive or a shipwreck exploration. The chef has an extraordinary number of qualifications to his name. He is a City & Guilds NVQ 3 professional chef, a dietary nutritionist, trained as a raw vegan specialist, a Bachelors Chocolatier L1 and has received training from Spanish fine dining restaurant El Celler De’ Can Roca and chef Gaggan Anand. With seven years experience on superyachts from 50 metres to 90 metres, he is well-practised at catering to an owner's every culinary whim. Lili boasts a brilliant crew of 13, including a masseuse, a professional diving instructor and much sought after chef. The on board instructor has been a keen diver for more than seven years, working professionally in the field for more than five. As a MSDT – a Master Scuba Diver Trainer – he is able to tutor guests through a huge variety of diving courses for a broad range of abilities while on board, whether that be for a one-off dive or a shipwreck exploration. The chef has an extraordinary number of qualifications to his name. He is a City & Guilds NVQ 3 professional chef, a dietary nutritionist, trained as a raw vegan specialist, a Bachelors Chocolatier L1 and has received training from Spanish fine dining restaurant El Celler De’ Can Roca and chef Gaggan Anand. 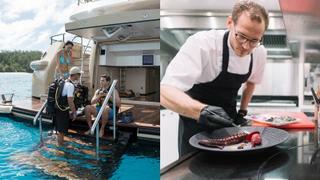 With seven years experience on superyachts from 50 metres to 90 metres, he is well-practised at catering to an owner's every culinary whim. With a cruising range of 4,500 nautical miles at 13 knots and a max speed of 15.5 knots, thanks to a pair of 1,308hp MTU 16V 2000 M70 diesel engines, Lili has already made her way to a number of astonishing destinations around the world, proving her adaptability and durability. Since June 2017, she has cruised to Norway, the Mediterranean, the Seychelles, the Maldives and Thailand, exploring their coastlines and waters while providing the height of luxury. Currently available for charter, she is set to discover some more amazing locations later this year, gaining a huge amount of experience in record time. With a cruising range of 4,500 nautical miles at 13 knots and a max speed of 15.5 knots, thanks to a pair of 1,308hp MTU 16V 2000 M70 diesel engines, Lili has already made her way to a number of astonishing destinations around the world, proving her adaptability and durability. Since June 2017, she has cruised to Norway, the Mediterranean, the Seychelles, the Maldives and Thailand, exploring their coastlines and waters while providing the height of luxury. Currently available for charter, she is set to discover some more amazing locations later this year, gaining a huge amount of experience in record time. Lili is an upgraded version of the Amels 180 Limited Edition series, built with a steel hull and an aluminium superstructure, to Lloyd’s Registry standards and is MCA compliant. Despite being one of a series, Lili is completely unique to the rest of the hulls and is one of the most customised in the range. Delivered in record time, Lili is the eighth superyacht jointly delivered by Imperial Yachts and Amels, their combined experience gives her extremely high quality credentials. With sleek exterior lines by Tim Heywood, her hull has been described as 'Castle Tan', making her stand out from all the white hulls in any marina. Delivered in summer 2017, her design focusses on indoor-outdoor living, meaning her exclusive layout allows for plenty of options for on-deck relaxation and entertainment. Lili is an upgraded version of the Amels 180 Limited Edition series, built with a steel hull and an aluminium superstructure, to Lloyd’s Registry standards and is MCA compliant. Despite being one of a series, Lili is completely unique to the rest of the hulls and is one of the most customised in the range. Delivered in record time, Lili is the eighth superyacht jointly delivered by Imperial Yachts and Amels, their combined experience gives her extremely high quality credentials. With sleek exterior lines by Tim Heywood, her hull has been described as 'Castle Tan', making her stand out from all the white hulls in any marina. Delivered in summer 2017, her design focusses on indoor-outdoor living, meaning her exclusive layout allows for plenty of options for on-deck relaxation and entertainment. She boasts an interior volume of 707GT, every inch of which has been styled by the renowned Laura Sessa Design, who has opted for a muted and natural palette with beautifully contemporary furnishings. Accommodation is for up to 12 guests in six cabins, which includes an extraordinary owner's suite on the bridge deck with its own private aft deck and a main deck VIP complete with a fold-down balcony for private oceanside meals or cocktails. On board highlights include a well-equipped gym, complete with treadmill, elliptical, weights and yoga equipment, a vast main saloon with large windows, an extremely deep, plush sofa, a 105 inch curved LED Samsung with surround sound and dining area, and a luxurious beach club that features a steam room, shower and dive store. If you're keen to experience the Meditterranean this summer on board the ultimate luxury platform, get in touch with Imperial Yachts, where Lili is managed for charter, with a weekly charter rate starting from €290,000. She boasts an interior volume of 707GT, every inch of which has been styled by the renowned Laura Sessa Design, who has opted for a muted and natural palette with beautifully contemporary furnishings. Accommodation is for up to 12 guests in six cabins, which includes an extraordinary owner's suite on the bridge deck with its own private aft deck and a main deck VIP complete with a fold-down balcony for private oceanside meals or cocktails. On board highlights include a well-equipped gym, complete with treadmill, elliptical, weights and yoga equipment, a vast main saloon with large windows, an extremely deep, plush sofa, a 105 inch curved LED Samsung with surround sound and dining area, and a luxurious beach club that features a steam room, shower and dive store. If you're keen to experience the Meditterranean this summer on board the ultimate luxury platform, get in touch with Imperial Yachts, where Lili is managed for charter, with a weekly charter rate starting from €290,000.